Do you switch on the TV and get bored of the constant stream of the ad after ad? Inbound marketing is the answer. Surely you are not the only one that ends up surfing the Internet looking for a different, more interesting type of content. That’s the tendency. Consumers have said that’s enough and that they want to interact with the brand in another way. Get ready because today you’ll learn about a strategy that will help you foster your clients’ loyalty so they can become promoters of your brand. Let’s start with the definition. According to Hubspot, inbound marketing is an approach focused on attracting customers through content and interactions that are relevant and helpful — not interruptive. With inbound marketing, potential customers find you through channels like blogs, search engines, and social media. What do we have to focus on within this definition? Attracting: we do not chase the client the way we do with traditional marketing (we’ll come back to this later). The user comes voluntarily. Qualified traffic: your content should focus on your audience and not on just anyone and everyone. Here we can again see the importance of defining the buyer persona. Creating loyal customers: we won’t stop at attracting, we will continue to create content that makes the users become a lead and then a client (continuing through our sales funnel). Now you may have some doubts, but don’t worry because we are going to clarify each point as we go through this post. 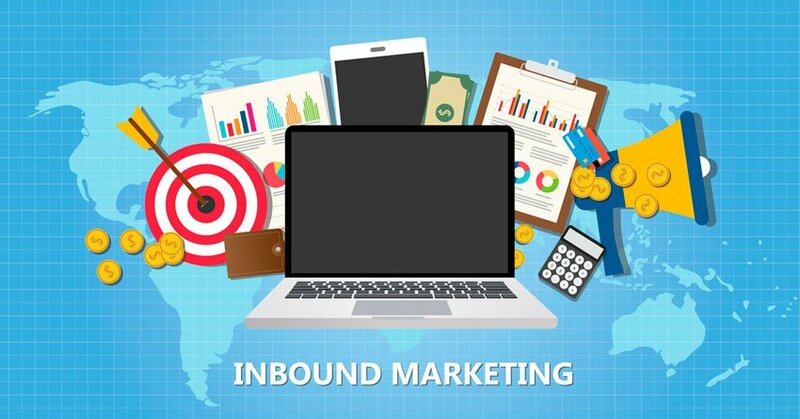 The opposite strategy of inbound is outbound marketing (the traditional way of promoting products and services). We are talking about newspapers and television ads, banners, pop-ups… they are unexpected advertisements fighting for a piece of your attention. Often, without thinking much about the how. However, inbound focuses on attracting clients thanks to content. What do we get from that? A total change in the user’s attitude towards our brand. Instead of being annoying, we are seen as useful to our clients. Besides more final sales, applying an inbound marketing strategy will give you some other added benefits. Authority: we already talked about this in our post about content marketing, creating content about your field makes you a leader in that field. It saves you money: it is more profitable than traditional marketing. It is calculated that inbound leads are 60% cheaper than the outbound ones. It creates a good image: with inbound marketing we don’t talk about the product, but about people and their needs. This will make them see us with better eyes than if we try to sell them directly. Qualified traffic: we attract clients that have a real interest in our products. This will be a real boost to your conversion rate. Heterogeneous customers: when selling online, we have the challenge of getting different clients to the different products they are each looking for as soon as possible. How do we cope? By improving the website architecture, the navigability, or adding an internal search engine. Different kinds of products: in your e-commerce, you may have impulse-purchase products and others that require a bit more decision-making. Getting to know the sales cycle of each one and adding it to the strategy is a real challenge. The client can’t always be educated: there are some sectors in which the whole process is just more difficult. Too much segmentation: sometimes we want to get so close to a certain profile that we may filter out and lose potential clients on the way. An inbound marketing strategy can be divided into 5 stages. Let’s break them down one by one. In this post, we explained in depth how to develop a content marketing strategy. That’s why in today’s article we are going to focus on just the most important parts. Buyer persona: your content will only work if it’s attractive to your target audience. You should focus on learning about their problems and necessities. If you don’t know how to define it, have a look at this post. Format: there is more than just text, you also have videos, podcasts, images, etc. Editorial schedule: establish the frequency and when you will publish. Besides content creation, there are other strategies that you can use to get more traffic. Social networks: share interesting content for your audience on your social networks so you can direct traffic to your website later. Once they are on our website, we continue to push them through our sales funnel. The second stage is about converting that visitor into a subscriber (also known as lead). In order to get their email addresses, we can offer them an eBook, a course, or even a free trial of our services. There are two ways of doing this. Lead magnet (“bait for hooking leads”): for example, if you have a dog food e-commerce, a good lead magnet would be a “Beginner’s Guide to Dog Nutrition”. Content upgrade: this is extra content that is added to the original bit. Following the same example, if you wrote a post about “the best time to feed your dog”, the content upgrade could be a downloadable calendar to keep track of the times you feed your dog. It is also very useful to create a segmented list. From this moment on, the email will be our main communication channel and it will allow us to move into the third stage of the inbound marketing strategy. Here we have two sub-stages. The first one is to find out if the users are ready to buy. On the other hand, in the second stage, we will lead them to the purchase with some specialized content. The first step when we have a new contact is to find out how “ready” the client is to buy (lead scoring). If your e-commerce is a small one or it is just starting out, you don’t need to worry about this too much — you need to focus on the following section. This is the process of educating, growing, and feeding (quite literally “nurturing”) the potential client. A common way to do this is with an automated technique using an autoresponder (a programmed sequence of emails that users receive one by one). Cold lead: we send general content so that clients can see the different solutions available. They start to notice the need. Warm leads: they know their problems and they are looking for solutions. Here we can send success cases, statistics, or studies supporting our products as a solution to what they need. Depending on the way clients interact with the emails, we will send them more appropriate content so they continue to follow the funnel. If you have already started thinking, “okay, but when do I sell?”, this is the section you are looking for. In one of the last emails of the sequence, we will send them a sales email about a product or service. It normally involves a discount, though a bonus gift works too. It is very important that you set a deadline for the discount in order to create a sense of urgency. When clients think that they might miss an opportunity, they’ll feel a bigger necessity to make the purchase. Besides this offer email, we will send at least one other email reminding them that time is running out. Now it’s time to give it the finishing touch — our job is not done after making the sale. Now, your goal is to send them more valuable information so that they can make better use of whatever they have bought. At this point, it is also important to be mindful of your post-sales service. External copywriter: if you don’t want to write your own content, you can hire a person to do it for you. Social networks automation: tools that move your content automatically: Buffer, Hootsuite, and Postcron. Advertisements: Facebook Ads, Twitter Ads or Google Adwords will be your allies to attract traffic to your e-commerce. SEO: in order to find keywords, you can use Ubersuggest, Hypersuggest, or Semrush. If you are planning on writing your own content, a very useful tool to find ideas for your posts is Buzzsumo. Here we can use the email marketing tools. We already talked about how MailChimp, Active Campaign, GetResponse or MailRelay can help you in this article. You will need some sort of tool to create the feeling of a possible missed opportunity. If you use WordPress, you can use Page Expiration Robot, a plugin that creates scarcity to go along with the call to action. There are also email marketing tools that allow you to send and automate emails when clients abandon their carts. For example, Active Campaign. Conclusion: it is always better to attract than to chase. Although traditional marketing is still effective, inbound marketing strategies are gaining more and more territory. Users are tired of the number of ads they are exposed to and are therefore much more receptive to these kinds of experiences. Previous Article Do you know the meaning of this 22 words we use in everyday life?